In case you missed it, October 13th (yesterday) was National Metastatic Breast Cancer Awareness Day. I thought about doing a post on the reasons this day is so important for women like me with metastatic disease, but instead I got bogged down in watching terrible local news coverage of the Komen Race for the Cure here in Phoenix, which focused so much on victory over cancer and the racers' fun costumes that I wanted to scream. I'm becoming an old curmudgeon well before my time. * Full disclosure, I've done the Komen race, and it makes me just as uncomfortable in person. As far as I noticed, there wasn't a single mention of advanced disease--or even the possibility of it--in the Komen coverage. Yes, early detection increases the odds you'll beat breast cancer, but it's still no guarantee that mets won't show up later. In fact, 20-30% of everyone diagnosed with breast cancer will at some point down the road develop metastases. It may even be after the magical 5-year mark. Sound too crazy to be true? Read more about the facts here. At some point, we need to stop the madness of packaging this disease in pretty pink ribbons and talk about what's really happening: approximately every 15 minutes a woman dies in this country because of breast cancer. All of those deaths? From metastatic disease--like mine. And the numbers haven't changed much in the last 30 years, despite more hype, more awareness, more pink. 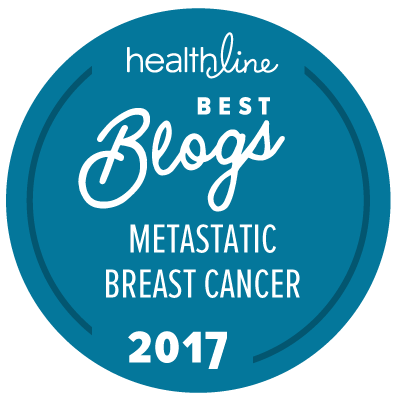 I guess I am writing a post about why Metastatic Breast Cancer Awareness Day is so important. But as my friend Nancy puts it--really, just one day? And I've griped about the pinkification of October before, but in case you need more reasons to be grumpy on a Monday, here are some interesting articles I've come across recently. - Why I almost can't turn on the t.v. on Sundays anymore. - Apparently this also happened yesterday? - This blogger's reaction pretty much sums it up perfectly. - And if you think bras are uncomfortable, try blind consumerism. - Finally, a controversial argument by one of breast cancer's most ardent researchers and fighters that all cancer is metastatic. If I can please implore you, if you're going to give, please donate to breast cancer charities that fund research, not awareness. We are literally dying for it. Want a few suggestions? My friend Carolyn put together a list, below, and of course I also support the efforts of the Avon Foundation because they put real dollars toward research and have never shied away from the realities of this disease. Here are some organizations where you may consider donating a few dollars; all receive "A" ratings for using most of their profits towards funding research and support rather than fundraising.... Breast Cancer Research Foundation, National Breast Cancer Coalition Fund, Living Beyond Breast Cancer, Young Survival Coalition, or Breast Cancer.org. One final, less grouchy, note: if you're going to be aware, be aware of your own body. Any changes that don't seem right to you? Get them checked out, and press your doctors to take you seriously. Breast cancer in younger women tends to be far more aggressive than the disease that strikes women who are post-menopausal. My primary tumor was literally the size of a walnut under my skin, and my doctors were still insisting it was mastitis. So I switched doctors. And then a week later, my new doctor was calling to tell me it had already spread to my lungs, my lymph nodes, and my spleen. Thanks for sharing a link to my post. Yeah, one day isn't nearly enough is it? Keep talking. Keep writing! Hopefully more and more will listen to voices like yours. Disheartening, indeed. Since my diagnosis, I have felt a great responsibility to educate people about the realities of breast cancer, to the extent I'm able given my experience, maybe especially because I know the media and many awareness organizations are not having that conversation. I'm a little voice, but if enough of us speak, we'll get heard. Jen, you are a powerful voice with an important message. I am completely with you on this. Loved the links, too!! !